Unique keno variants can be hard to come by, but NeoGames has made it easier. While the provider may not be a huge name in the iGaming industry NeoGames is still quite innovative – so much so William Hill purchased 29% stake in the company. We take a look at the software provider – one of which you may not have heard before – and what it brings to the keno table. NeoGames launched in 2005, predominantly producing scratch cards on both desktop and mobile devices. The company then expanded their gaming catalogue with the main focus on the instant play market. They’ve grown to offer over 100 games including keno – plus scratch cards, lottery, and bingo games – all developed with Flash technology meaning both Mac and PC users can play the games. NeoGames also offers a platform known as the NeoSphere, which combines a game management system with customer support, marketing tools, and responsible gaming rules. Most players will find the games among many other software provider’s games, like Microgaming. In August 2015, William Hill – one of the largest gambling companies in the world – purchased 29.4% of NeoGames as a means to venture into the lottery market. This resulted in iLottery 360, which is available in 10 countries, including the US which is quite impressive considering the countries lack of enthusiasm when it comes online lottery options. NeoGames is licensed by the Alderney Gaming Control Commission (AGCC) and all games are tested by iTech Lab of Australia – a reputable auditing company. 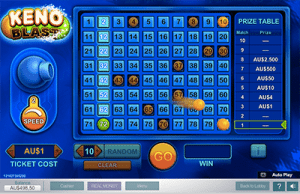 Most importantly, NeoGames are responsible for some of the best keno games available online. 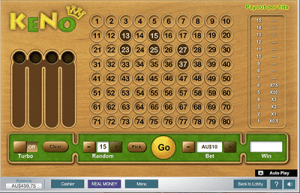 NeoGames offers keno for players after unique gameplay – traditional gameplay is also available – and for those who want bright and fun graphics. Minimum bets are quite low and while maximum bets aren’t too high you can play as many rounds as you wish. 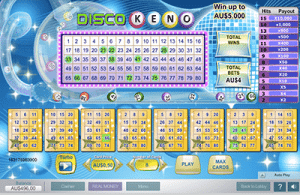 Disco Keno shows what NeoGames is made of when it comes to their lottery operations as the title is a hybrid of keno and bingo. There’s eight bingo cards available and you can play a minimum of one or all eight. When it comes to the keno part, there’s 80 numbers to choose from, with up to 15 eligible to pick, and 20 drawn. When you play each round the balls will appear through the clear tube and will be revealed on the bingo cards in a green shade. You need to match numbers on the cards in order to win. The background features a blue shade with sparkling lights and a huge disco ball, with the paytable situated on top. The minimum bet available is $0.25 per card and the maximum is $10 – so you can wager up to $80 with all eight cards in play. Keno Blast offers traditional gameplay with 80 numbers available and up to 10 spots eligible to be chosen. The unique feature to this game is you can speed up gameplay by clicking the speed knob located next to the game screen. You can start at 1 for standard speed and go up to 3 for super speedy gameplay – the balls are revealed quicker. This is a perfect title for those who don’t want to wait for the outcome to be revealed – or for those who hate the three minutes between games which we find at land-based keno venues. The minimum bet here is $0.50 and the maximum is $10. Keno Deluxe offers regular gameplay and interesting graphics with the numbers set on an arcade style game, similar to a pinball machine. Up to 15 spots can be chosen from 80, with 20 drawn, and the balls appear in four tubes to the left of the game screen. Players can opt for the Random button where a specified number – from one to 15 – is chosen randomly, similarly to the QuickPick option on keno found in pubs and clubs. There’s also a Turbo option on this title which is similar to the Blast variant where you can speed up gameplay – only there’s no low, medium and high variances, just the option of standard gameplay or turbo gameplay. You may find it faster than the Keno Blast even in the third gear. The minimum bet available here is $0.20 and the maximum per game is $10. 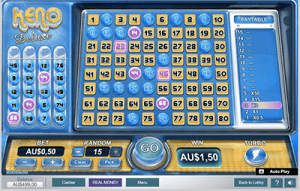 Keno is perfect if you’re after a standard keno game – it is quite similar to Keno Deluxe. Set on a simple brown backdrop, Keno offers 15 spots to be picked out of 80 with 20 drawn. You can use the ‘Random’ button to pick these numbers and the Turbo option is also available here. The only real difference between Keno and Keno Deluxe is the graphics, as even the limits are the same with a minimum of $0.20 and the maximum of $10 per game available. NeoGames isn’t available everywhere as it isn’t as big as other online keno software developers like Net Entertainment or Microgaming, but it is available at some of the leading online casino sites, many of which do not accept Australian players. For the best Aussie-friendly websites to bet on real money keno online, we recommend Planet Lottery and Lottoland which offer 24/7 keno betting on a range of Australian and international keno draws.